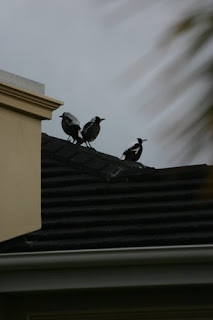 I thought it was unusual to see 3 magpies all sitting together on the house. This house is not in the countryside, which is where I think of magpies, it is in the suburbs. I wonder what shiny thing was on the house that they were all drawn to it.